I just gave the following short talk on Saturday, June 4, 2016 at the Taylor University Colloquium. My brief presentation was part of a variety of academic papers that was presented there. 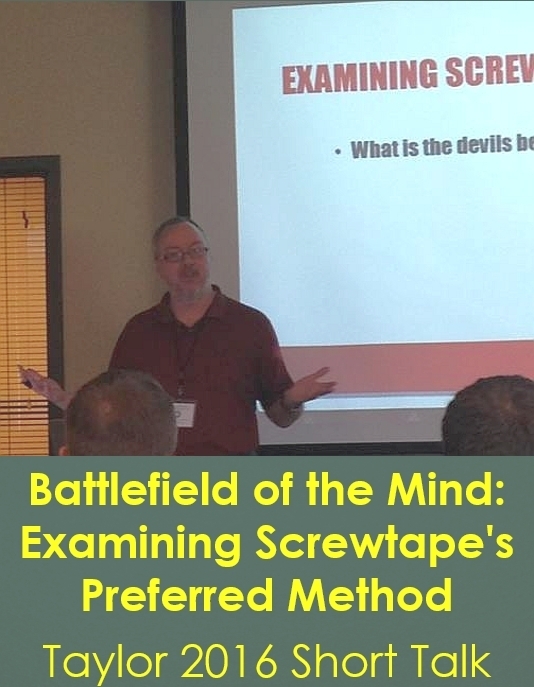 In it I explore the 13th through the 17th letters from The Screwtape Letters to reveal where an often overlooked "preferred method" of the devils is suggested. Previously I spoke on the initial twelve letters (see link below) when I gave a keynote address at the Inklings Fellowship Weekend Retreat at Montreat College. The material from both is adapted and an expansion of material from my first book, C.S. Lewis Goes to Hell: A Companion and Study Guide to The Screwtape Letters. While I do give a summary of the unique aspects of my book, the main focus of the talk is about the devils' "preferred method" to keep us from living up to God's potential. Visit my website to contact me about giving this talk or a three or four part presentation on all of the places this method is mentioned or alluded to.